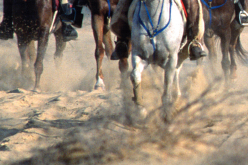 “There have now been six officially recorded equine deaths in international endurance rides at Dubai International Endurance City (DIEC) within a 3-week period. Any other competition venue with such a shocking “strike rate” would be shut down indefinitely pending an investigation. Two sustained catastrophic injuries (fractures) that required euthanasia in A 40Km novice qualifier on January 23. Two died at DIEC on January 4 and one on January 7. This is despite DIEC being under notice to observe the rules and required horse welfare measures after the Federation Equestre Internationale (FEI) excluded DIEC from FEI competition from April-November 25 2016 and stripped DIEC of the 2016 world championship hosting rights. And also despite the FEI engaging DIEC in yet more “urgent talks” since the 3 fatalities earlier this month. 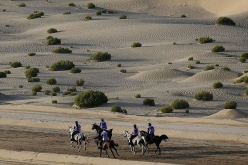 DIEC is the principal endurance venue in Dubai and is owned by the ruler of Dubai, Sheikh Mohammed al Maktoum. Having signed a Ride Organiser’s Protocol in November so as to be re-admitted to the FEI calendar, DIEC staged its first FEI ride of the winter season on December 12, 2016. The following week the first horse of the year died, bringing the DIEC total so far for the 2016-2017 winter season to six officially recorded deaths. The extra significance of yesterday’s ride (Jan 23) where 2 died is that it was NOT a race ride – it was a 40km qualifier which is a fixed speed ride to be completed no faster than 16 km/h. We have heard some reports that many riders continued at their usual break-neck pace, then hung around for a while before crossing the finish line so that their aggregate time was still below 16km/h. We have seen that tactic employed before. Very large fields may have led to the chaos. Last year the FEI capped field sizes in the UAE at 150. This season, for undisclosed reasons, this has been relaxed and there were around 300 starters in each of the rides. I can supply exact detail if you wish to follow this up. 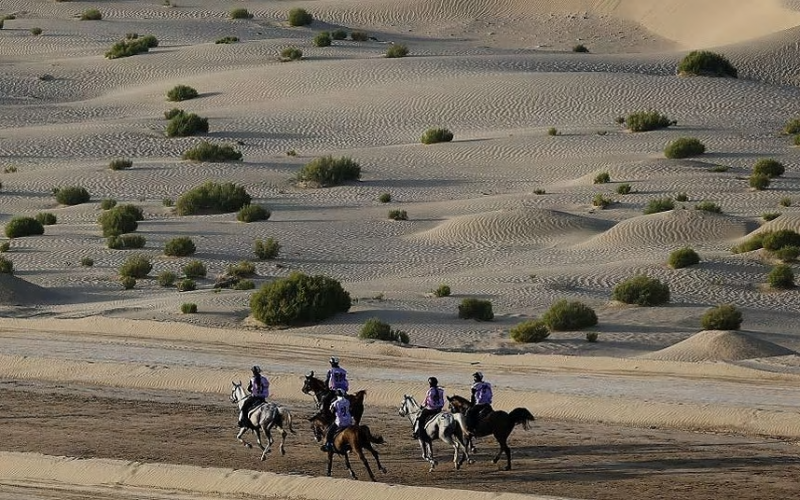 In contrast, only one death has been recorded so far this winter season at Al Wathba, the major endurance venue in Abu Dhabi which is owned by Sheikh Mansour al Nahyan. There have been no recorded fatalities at all at Boudhieb in Abu Dhabi, where the new protocols pioneered by Sheikh Sultan al Nahyan are producing greatly encouraging results. Unfortunately, DIEC seems determined to do the opposite. This gives the FEI an extra headache for it can no longer punish the UAE national equestrian federation, the EEF, as an entity. That would have the unintended consequences for the good work being carried out at Boudhieb. As a reminder of the background, the FEI suspended the UAE federation because of its endurance horse welfare crisis for four months in 2015. 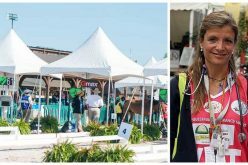 UAE was readmitted to FEI competition in August 2015 after signing a legal agreement. 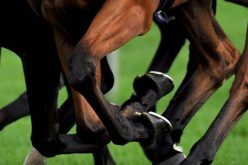 Following a scandal at Al Wathba in February 2016, where grooms ran onto the field of play and beat home five exhausted horses in a young riders race, competition was again suspended throughout the UAE for a week. The UAE federation signed a further legal agreement to obey the sport’s rules with the FEI. There has been no discernible improvement. 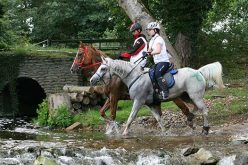 The sport of endurance elsewhere around the world is premised on using your horse carefully so that it is “fit to continue” at the end, whether the ride is shorter distance or the “championship” distance of 160km in a day. Nonetheless, completion rates of 20%-30% remain the norm. On March 19, 2016, the intended test ride for the 2016 world championship was due to be staged at DIEC. The organisers at DIEC refused to apply extra welfare measures requested by the FEI aimed at reducing attrition. As a result the FEI disaffiliated the March 19 ride and the following month removed the world championship event (scheduled for December 2016) itself from DIEC. (It was relocated to Samorin in Slovakia). 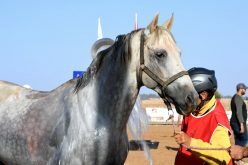 “The two latest equine fatalities during a national event the Dubai Equestrian Club national event (CEN) held at the Dubai International Endurance City (DIEC) on 23 January are very worrying, and there is an urgent need to understand from a veterinary and scientific perspective what is causing these catastrophic injuries. “As I’ve said before, it’s clear that over-training is probably the major cause and respect of rest periods is also crucial, but the new senior management at the UAE National Federation is very much more hands-on than the previous regime and we will continue to work closely with them to address these serious issues.